Info Trace in circles to swim! Stay within the gauge to maintain speed! Compete to finish one lap of a 50m pool with the best time. 100m Freestyle Swimming is an Event that appears in the Nintendo 3DS version of Mario & Sonic at the Rio 2016 Olympic Games. The objective of the event is to swim two lengths of the pool in the fastest time, with the starting world record for the event being 0:46.91, and the starting Olympic record being 0:47.05. The playable characters in this event are Mario, Peach, Wendy, Sonic, Tails, Amy and Mii, with Wendy being unlocked by beating her in 100m Freestyle Swimming Plus on the sixth day of Mario's story in the Road to Rio mode. Toads appear as referees in this event. In the Road to Rio mode, 100m Freestyle Swimming appears as the event on day 6 of Mario's story. This event starts with the characters preparing to dive into the pool on the starting platform. Once "Ready?" appears on screen, the player can touch and hold the Action Button to charge up energy for their initial dive. The longer the player charges for, the faster their dive and starting swimming speed will be. Once "Go!" appears, the player must release the Action Button to dive into the water and start swimming. Doing so with perfect timing will give them a Rocket Start, causing the character to gain a large speed boost for a short amount of time. Once the character starts swimming, the player must draw circles within the marker on the Touch Screen to cause their character to swim. The faster they draw the circles, the faster the character swims, as indicated by the stamina meter. If the meter is filled, a five second countdown begins, and if the player does not slow don enough during this time, the character will stop and lose all of their speed. 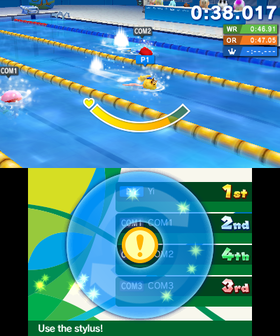 As the character approaches the end of the pool, the player will be prompted to turn around by pressing the Action Button when the line touches the wall. They will be rated on their timing and will gain a speed boost depending on how good their timing was. If they fail to turn around, the character will lose all of their speed. As the player approaches the finish line on the second length, they are able to perform a Super Swim which gives them a short speed boost with a unique character effect. This can only be used once in the event. Release the Action Button in perfect time with the start signal to get a Rocket Start. When turning, tap the Touch Screen just before you hit the wall to perform a quick turn. This page was last edited on March 8, 2019, at 23:42.